After a rather heavy rib dinner on Friday night, we both thought dining “light” was a must for Saturday’s supper. For us, lighter fare typically means fish, and one of the lightest I know how to prepare is sole. So after a day of watching classic films on TCM, I headed off to the fish market, where I found some sparkling white, wild lemon sole. Although I am trying to expand my limited seafood repertoire, sole for me usually equates with sole oreganata, one of the mainstays of Friday night meals and Lenten suppers from my Italian-American boyhood. Boyhood dining memories also include my father’s taking us to one of the most famous Italian-American restaurants in New York City, Patsy’s. In fact, my dad was the attorney to Patsy Scognamillo, the restaurant’s founder. This is one of the reasons I was gifted not long ago with a copy of Patsy’s Cookbook: Classic Italian Recipes from a New York City Landmark Restaurant written by the founder’s grandson, Sal. As I thought, the book had, along with many celebrity tales, an appealing recipe for fillet of sole arreganata and I opted to pretty much follow that for cooking the fish. However, out of deference to my Sicilian mother and Neapolitan aunt, I chose to make their breadcrumb topping. In a bowl, stir all the dry ingredients and then add the olive oil a tablespoon at a time, stirring with a fork until the breadcrumbs are moistened. You may use a little more or less olive oil depending on the breadcrumbs. The mixture should have just enough oil to clump together lightly when pinched with your fingers and to allow the breadcrumbs to brown and not burn when under the broiler. 2. Place the fish fillets in a baking dish large enough to hold the fish in a single layer and dot with the butter. 3. Combine the lemon juice and wine in a small bowl and spoon over the fish. The juice should be just enough to come up to the sides of the fish but not cover it. Season with the paprika. 4. Bake for about 15 minutes, or until the fish flakes when tested with a fork. 5. Remove the fish and set the oven to broil. 6. Sprinkle the topping on the fillets and broil until lightly browned, about 2 minutes. 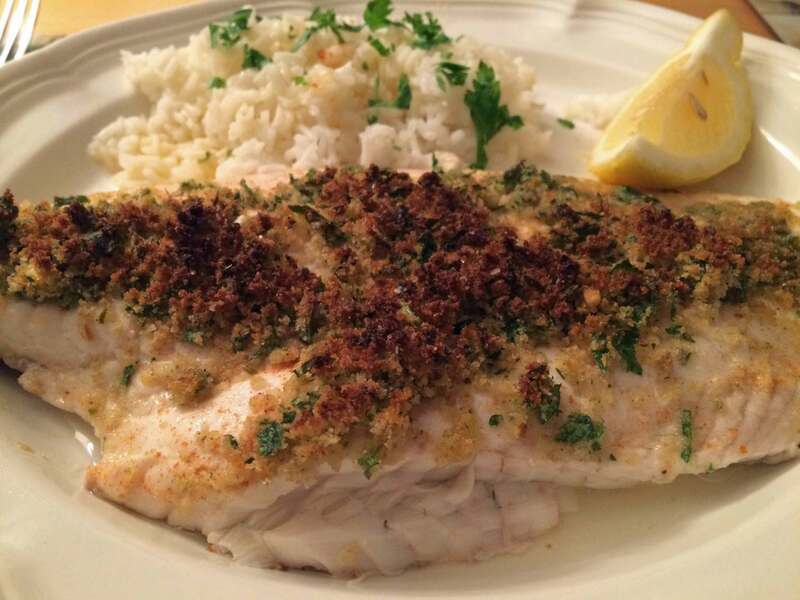 Serve with white rice sauced with the juices from the fish and with lemon wedges as garnish. Serves 2 as a main course. Nice lighter supper. I have recolections of a similar dish that I would order regularly from an Italian restaurant I’d frequent in Seattle. I don’t think I’ve had it since and it’s about time I have it again. We’re getting some nice turbot at the fishmonger these days so I’m put this on my cooking radar screen. Thanks, Ron. The topping would be great on turbot.